Rubfila International Ltd is in portfolio of Bharat Jayantilal. He is one of the top investors in India. The company belongs to Rubber sector. As per the Company website it is a Public Listed Company promoted by Rubpro Sdn. Bhd., Malaysia along with Kerala State Industrial Development Corporation (KSIDC). The Company has international presence and exports to more than 25 countries including US, Latin America countries, Asia and Europe. It has marketing offices in major cities like Mumbai, New Delhi, Kolkata and Surat as well. The Company is head quartered in Kerala. The stock has excellent dividend yield of more than 2% at current market price. Over the years Company has grown incrementally every year with some years of consolidation in between. Year 2012 was special for the Company as it broke the long time barrier of 20 INR. 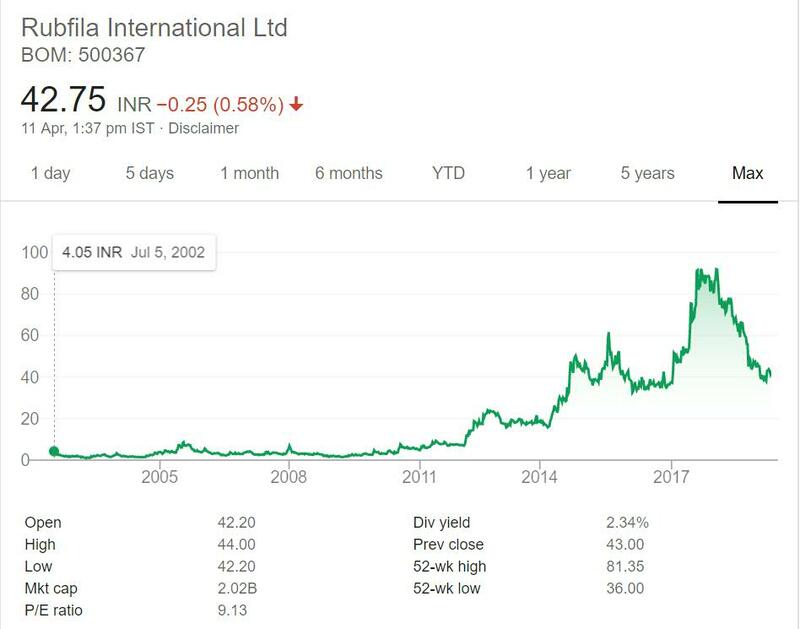 Since then stock has not slipped below 20 mark and have gain from there. Rubfila International Ltd is a Rubber Company.Rubber is interesting sector. There are two types of Companies in this sector. One those manufacture natural rubber and second which deals with artificial rubber. Most common usage of Rubber is Tyres. There are other usage as well but this is the most wide spread usage of it. So rubber companies cater needs of automobile company. The growth in Auto sector will indirectly impact this sector. This Company creates products from natural rubber available from Kerala. It is worth mentioning that Kerala is largest producer of Natural rubber in India. I am very much bullish on this sector as demand of rubber products will be there. This sector can be termed as ever green sector. The problem will arise if there is any threat to usage of rubber in Tyres and other similar places. Often people cite metros and Hyperloop as one challenge. But we should not forget that these are public transport system. People will continue to use private or personal transport system for status and luxury. I have already invested in this sector and will increase exposure to the Company I have invested in. As of now I will not track this Company. You should compare this with other companies and make a decision.